Below you’ll find the canonical reference for Father’s Day email planning. From email examples to specific promotional strategies, we’ve included everything you need to ace your campaign. Who doesn't love a good dad joke? (Is there such a thing as a "good" dad joke?) Banana Republic has a good time with the concept. We also liked the way the content (oversized type to set up the joke, with the punchline leading right to the call-to-action button. The social-media tie-in ("tell us your favorite dad jokes") is a nice touch, as is the simple but carefully chosen product edit. This email takes a "dad as hero" approach to Father's Day content, which is refreshing when so many other brands send "dad as goofball"-themed messages. 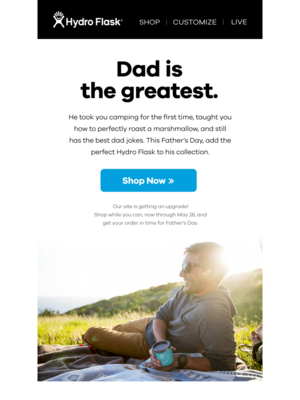 We picked this email because it ties different Hydro Flask products to some common dad-related personas (craft beer enthusiast, grilling genius, outdoorsman) that have been updated to reflect modern – even hipster – dads. If you want to see the marketing and engagement possibilities that interactive email offers, study this email from a UK restaurant. It gamifies the gift selection process, but it keeps the activity within the email. Once the user reveals the dad personality, the CTA appears. The instruction "Take the Quiz" makes it irresistible to the reader. Clever! Is this a hero image or what? Companies that market home-security devices don’t usually take such a light-hearted approach, which is why this email stands out. The subject line, a standard offer, doesn't tee up the humorous approach that leads off this email, but that enhances the impact. Emails showing company employees and their children have been a regular feature of Mother's Day emails, and we are happy to see it begin to make inroads on Father's Day as well. We picked this email because it shows a diverse group of Frank And Oak employees and kids who are good-looking but not model-perfect. We also like that it shows the men wearing branded clothing in everyday poses, which show the clothing off to better advantage because readers probably can better picture their dads in these duds. 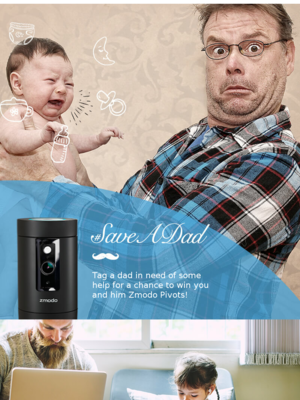 Start planning your Father’s Day email strategy with great examples. This Jimmy Jazz email calendar is based on Jimmy Jazz, who sent 9 emails for Father’s Day in 2018. This YETI email calendar is based on YETI, who sent 3 emails for Father’s Day in 2018. This Chaco email calendar is based on Chaco, who sent 2 emails for Father’s Day in 2018. Will you simply send one email on Father’s Day or will you send a few emails leading up to it, including a “last chance” email once the event is over? Based on 5772 emails mentioning "fathers day", "dad" in the subject line. Discover the most popular types of promotions used for Father’s Day. Understand how steep a discount companies offer for Father’s Day. You can toggle between Dollars Off and Percent Off. Ace your Father’s Day email content with these ready-to-implement strategies. Enjoy! Poor old Dad can’t catch a break. Fewer people shop for Father’s Day than for Mother’s Day, and the ones who do spend less. But the spending gap is narrowing, according to the National Retail Federation’s Holiday Spending guide. Shoppers’ increasing willingness to open their wallets is good news for your Father’s Day email campaigns. Gift advice that shows some ingenuity, plus copy and images that use humor and appreciation for all kinds of dads and sentiment can persuade more subscribers to shop with you. 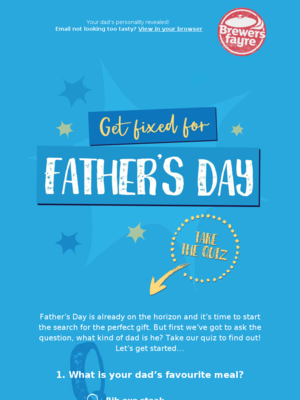 Here are four strategies you can use in your Father’s Day email campaigns. Your customers might know the brands their fathers like but have no clue what to buy him. Help them out by sending a gift guide showcasing gift-worthy items at different price points. This is a handy way to promote merch your shoppers might not find otherwise. Find some clever ways to present your guide, too. Many brands now tie their product assortments to themes such as personas, interests, activities, personalities, etc. Another tip: Create more than one guide, and devote each guide to a different theme. You’ll avoid the need to create a “something for everyone” assortment of products and also increase the chance that you’ll present gift ideas that your shoppers wouldn’t have found in their own browsing. Dads often get the short end of the stick. Even Father’s Day is almost an afterthought. It comes during summer, after most schools finish for summer, so Dad doesn’t get cute little art projects like the ones that come home for Mom. This is your opportunity to put Pops front and center in your email messages. It’s a rite of passage that your father will embarrass you, whether he shows up wearing black socks with sandals or cracks jokes that make you cringe in front of your friends. But it also means that humor can resonate with your customers and give your creative team room to play. You don’t need to highlight a sale or discount to have an engaging email that has good-natured fun with a traditional holiday. Good copy and fun imagery can humanize your brand and make customers feel good about buying from you. 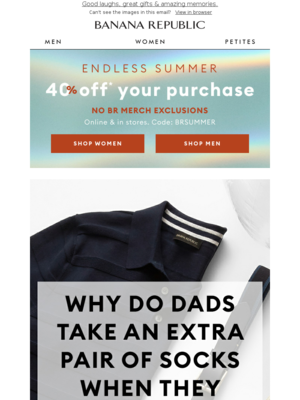 Since we began tracking Father’s Day emails, we’ve noticed more brands are sending emails that go beyond the usual Dad jokes or stereotypical he-man product assortments. Instead, they use content that taps into the emotional aspect of Father’s Day—not the hearts-and-flowers sentiment that pervades most Mother’s Day marketing, but quiet messages of strength and support. In an age when society no longer frowns on men showing emotion, these messages can strike a special chord with your readers and also help your brand stand out in the inbox over all of the “goofball dad” messages.